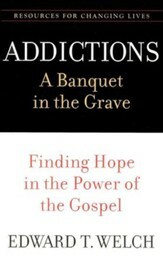 Addictions - A Banquet in the Grave: Finding Hope in the Power of the Gospel is a book for every Christian. Usually when we hear the word "addiction," our thoughts immediately leap to illegal drugs, alcohol, or nicotine. As the author correctly points out in this book, every Christian faces the temptation of addiction. The difference is some addictions are more acceptable than others. I can be addicted to books for example. Others can be addicted to food, credit cards, a beautiful yard, a hobby, work, or a multitude of other items in God's created order. Welch rightly calls addictions sin. Addictions reveal a love of self and thus are idolatry. In the practice of them we put ourselves above God. Addictions are sin. This diagnosis will not be acceptable to many in our culture. But it is what we need to hear. The author shows the pathway by which one can become addicted. More importantly he shows the only true way that slaves to addictions can be freed. Thus this volume is filled with hope for those who are tempted to or are already feasting on a "banquet in the grave." To detach with love from the alcoholic means to not allow what they do while drinking harm your emotional and or spiritual well being. Detaching with love is something learned that over time becomes a habit-a good habit actually.